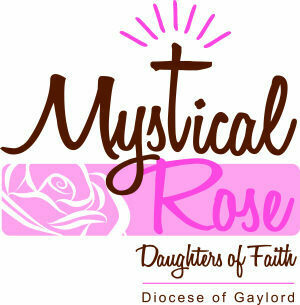 Mystical Rose Daughters of Faith provides the opportunity for young women (7th-12th grades) from across the diocese to come together for prayer, fellowship, and service and to help discern how they might be called to serve the Church as they grow into adulthood. Since its inception in 2011, the Mystical Rose Daughters of Faith have hosted various events, including a softball game with religious sisters, a visit to the Carmelite Monastery in Traverse City and a presentation from former America's Next Top Model contestant Leah Darrow. For more information on the group contact Marie Hahnenberg at mhahnenberg@dioceseofgaylord.org or call 989.732.5147.